In a box of old Masters of the Universe figures, an imposter was discovered. He stood the same height, had the same joint style, but did not have fuzzy underwear. He was a fakie. What to do with this dashing fellow in a white spacesuit with stunning red and blue details? I couldn't list him under He-Man and Masters of the Universe, as eBay expressly forbids listing fakies under the collection they are ripping-off. 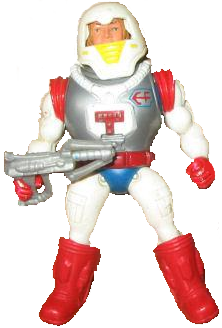 So he went under the inauspicious title of "80's Fakie Spaceman Action Figure." Who was going to want to buy that? I knew I'd never get rid of him. His listing got multiple bids! I was flabbergasted. People were psyched about Fakie Spaceman. The first high bidder didn't come through with payment in the allotted time, so Fakie Spaceman went to the next in line. The original winner eventually got in touch with me--he had been having computer issues--but he still really wanted Fakie Spaceman. I'm sorry, buddy. Fakie Spaceman was already gone. There are obscure things waiting to be found, and people that need these things. This is true of toys and genealogy. The right things and people may not be reunited immediately, but I never give up faith that the time will come.